Do you want to share funny and unique PowerPoint Presentations with your friends, family? Or even more people on YouTube? Therefore, you should convert PowerPoint to MP4 or WMV formats compatible with YouTube. 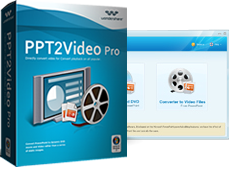 Now, Wondershare PPT2Video Pro can do that for you by just a few clicks. Convert PowerPoint presentations to WMV, MP4 compatible with YouTube. Retain animations, transitions, sounds and movie clips on output videos. Convert Up to 12 presentation files at one time. Broadcast yourself with your unique PowerPoint photo slideshow on YouTube. Play PowerPoint presentations on any media player, like some digital signage, digital photo frames. Play the presentations on mobile devices, such as iPod, iPhone, PSP, Zune and Apple TV. Share PowerPoint presentations online for both parents and children. Assign the homework online for students’ subscription. Educate people from all over the world with video sharing host like YouTube. Study for tests on the move with popular portable device. Practice and review your presentations online or on portable video player. Enrich your assignments, projects and other coursework submissions. Extend the utilities of PowerPoint for online marketing, like Promoting your product or company on YouTube to all the world. Show detailed reports, surveys and studies on any subject or domain. Train your employees on Web with PowerPoint courseware. Add value to speeches and engage audiences. Share PowerPoint photo slideshows of your holiday on Web. Learn about places of interest on your portable device as you travel. Demonstrate programs, budgets and plans to society online. Advertise new initiative and projects in new medium. Communicate with the word of the need for action and help.